On the plane ride over the Pacific there were no individual TV screens. This made me not watch 3 movies, play video games, and stay up for the whole flight. I didn’t even read anything or write. I closed my eyes and slept. That was new. It also helped that the movies being shown on the overhead screens were a a movie I’d never heard about, The Spiderwick Chronicles, and I Am Sam. 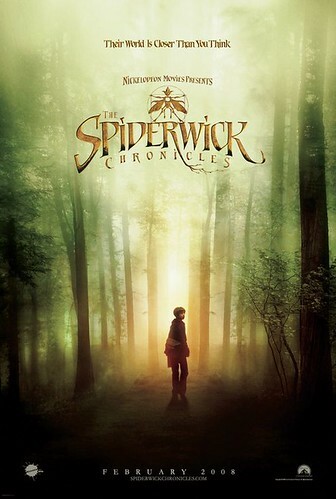 I did watch The Spiderwick Chronicles though. The movie was about a notebook writen long ago that held secrets of supernatural creatures, collected by Mr. Spiderwick. An ogre and his evil toad-like followers want this book so he could have power over all magical creatures. There are fairies, sprites, brownies, a griffon, hobgoblins. And the elderly daughter of Dr. Spiderwick, who’s dealing with abandonment issues of her own. Seeing imaginary creatures is always cool and the allegory of moving beyond daddy wasn’t tiresome. Clearly the writer had an absent father. The more interesting subtext is about the misuse and dangers of knowledge. Because Spiderwick refused to destroy his notebook, the bits of knowledge that leaked out to the ogre was used to hurt others, including his own family. And the message? Maybe we should just experience the wonders of the world instead of trying to unlock it’s secrets.